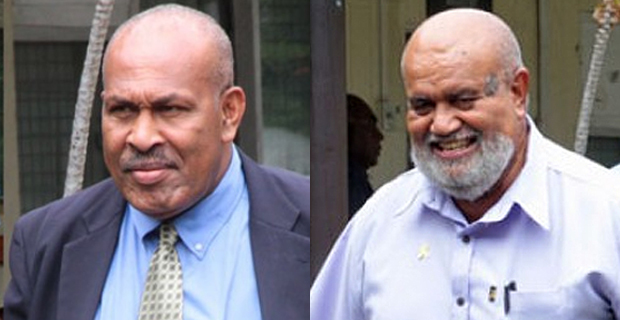 The trial of the former Acting Commissioner of Fiji Corrections Service Ifereimi Vasu and former Permanent Secretary for Agriculture and former Acting Deputy Commissioner for Corrections Service Peniasi Kunatuba will be held from 1st July to 26th July this year. The two have pleaded not guilty to one count of Abuse of Office appeared before Justice Riyaz Hamza today. Their bail has been extended and the case will be called again on 27th May. It is alleged that while being employed as a Fiji Corrections Commissioner and as a Director of Naboro Mart Limited, Vasu did arbitrary acts for the purpose of gain namely facilitating and approving the purchasing of goods to the amount of $131,683 from Naboro Mart Limited contrary to the Procurement Regulations 2010, the Financial Management Act 2004, the Finance Manual of the Fiji Corrections Service which were acts prejudicial to the rights of the Fijian government, the Fiji Corrections Service and the approved government contractors. It is alleged that this occurred between 11th July 2013 and 27th December 2014. Peniasi Kunatuba has also been charged with one count of abuse of office. It is alleged that between 31st January 2013 and 7th March 2014, Kunatuba approved the purchase of goods to the amount of $54,734 from Naboro Mart Limited contrary to the Procurement Regulations 2010.